For many, shopping can be a delightful affair of explorations, experimentations, and sometimes, just some plain old retail therapy relaxation. From high street fashion to groceries, shopping gives us all a sense of pleasure or fulfilment, one way or the other… Or so you would think, until you step into the world of parenthood. For parents, the once-loved outings to shop turn into much-dreaded nightmares. Gone are the days of strolling around carefree and window-shopping to your heart’s content. Once you’ve got a baby in tow, the idea of stepping out to shop takes a turn for the worse, and then jumps off the edge to a ten thousand feet fall. And no, that’s not an exaggeration. For parents, going out to shop means at least a few hours of gathering and prepping the kids to even get out of the house, and then half a dozen more spent on dragging squealing kids from store to store. Not to mention all the other pit stops you’ll have to make at toy stores, restaurants and bathrooms, just to keep the little ones in check. And it only gets harder when you’ve to shop for your kids. Even if you’re about to breach your tolerance level, you won’t let yourself stop because your kids deserve the absolute best, no matter what perils you have to go through to get the perfect pair of onesies. Raise your hand if that feeling sounds all too familiar. Going through the trauma of shopping hands-on for kids is now practically obsolete. The quest for quality ends here. All major kids wear brands like Kidology, now have an online presence, bringing respite for parents with young children. You can be at your favourite international stores without actually moving an inch. Except to whip out your laptop or smartphone, that is. Online shopping brings the latest fads in kids’ fashion right to the comfort of your home. Designer clothing at Kidology evokes wonderment, for the latest trends find their way into your little one’s closet! No more rummaging through piles to find the right shade, size or cut of pants you’re looking for. As long as you know the exact specifications of your child’s needs, just input your filters for size, style, colour, etc. and let the magic happen! You can find a comprehensive listing of all the pieces a kidswear brand has, even if they’re currently out of stock, so you explore a huge range, and even come back later for more. With easy navigation, you can view the items clearly, compare them, and make quick decisions. And if ever the delivered products don’t match your exact requirements, online stores always carry lenient return or exchange policies. It’s the ultimate salvation for busy moms and dads! Dispelling parents concerns about the quality assurance while shopping online, top brands offer nothing short of their regimented trusted degree of quality, online as well. 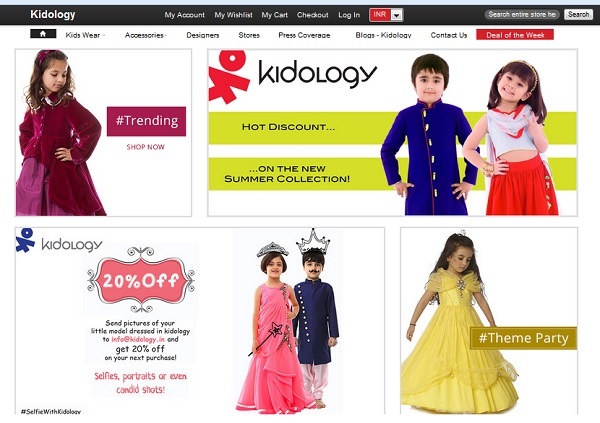 So online shopping for Kids from top brands is a safe bet for all your kids’ fashion needs. As it’s increasingly becoming the norm, quality is but guaranteed. We all know just how crazy big sales at stores can get. Chic little stores turn into warzones, and men and women battle it out to get to the best deals first. If you’re even so lucky as to make it into a sale, by the time you’re in, you’re left with very little choice. Online, you can shop during sale season without the crazy crowds and queues, on your own time, in your own home. What’s more, you can sign up for newsletters and get special discounts, vouchers and early notifications for sales. Shopping has never been so easy. With Kidology, you can swiftly skim through a brand’s collections, choose the items you love with just a single click, and make your payments safely and securely –all while you’re in your jammies. But mostly, what I’m trying to convey is if you have access to the Internet, you need to start shopping online for your kids, right away; it’s just that simple. Keep your kids happy, and keep your shopping speedy!